Menopause Greasy Hair: What’s Making Your Hair Greasy? What’s the Deal With Menopause Greasy Hair? Your teenage years are waaaaay behind you. You are a woman — strong and confident with years of wisdom and life experience to share. But annoyingly, suddenly your hair is as greasy as a deep fryer. You might find even previously thick hair is thinning or receding and your routine of washing it every three days is just not enough — it’s greasy just hours after your shower. What’s Making Your Hair Greasy? Are you wondering what is causing the change? I’m guessing you won’t be too surprised to learn that our constant companions through the best and worst of times, hormones, are playing havoc with your locks if they are looking more lank than lustrous. Diminishing estrogen during menopause can cause changes to your skin and of course hair follicles are part of the anatomy of skin. 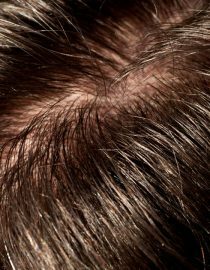 On the scalp, growing phases can be shorter, so hair won’t grow so long before it sheds. Strands may be finer and weaker and of course your whole head of hair might feel greasy. It might seem like a minor issue to deal with. However, as it is a very visible sign of aging, it can cause considerable psychological distress to many women, so it should never be dismissed as just vanity. My own experience was that my hair receded at the temples, became greasy and was not coping with my previous coloring routine. My answer was to get a drastic makeover leaving me with short graying hair, which I love, but not everyone wants to go to these lengths! What Can Be Done About Greasy Hair in Menopause? There are other measures you can take to tackle at least the oiliness. Solving this may help with issues with facial skin and pimples too, which is a bonus. Firstly, explore the shampoo section in your favorite drugstore. There are cleansing products for all kinds of hair and it’s not necessary to spend big bucks to find one to suit you. Choose something mild or specially designed for oily hair. You may have washed your hair the same way for decades, but you might be exacerbating the problem by overstimulating the oil-producing sebaceous glands at the hair roots with enthusiastic soaping. Be gentle with your scalp and avoid vigorous scrubbing or repeated soap and rinse routines. If you have greasy roots and dry ends, some experts recommend gently massaging shampoo into the scalp only, then letting the soap rinse over the lengths unless your hair is very dirty. And by that I mean dirty with actual dirt/mud if you have been gardening or coal mining maybe. Use lukewarm water, as hot water stimulates those grease-making glands on your scalp. If you are brave, a blast of cold water at the end of your hair-washing can help close up those hair follicles and cut down on oil production too. It’s apparently a myth that washing your hair every day will encourage it to become even greasier. Oily hair requires frequent washing to remove sebum (oil) from the roots, which will work its way along the length of the hair if left. Apparently washing your hair early in the day helps — sebaceous glands work harder at night so you can wake up and wash that oil right out of your hair. Avoid over-conditioning. You might find you actually don’t need to use conditioner after shampooing any more, or you might just need to add a small amount to the very ends of your hair. You should also avoid using serums or any cleansing or styling products containing oil or silicon — products like this may advertise that they make your hair shiny or silky, but they will just render greasy hair flat and limp. If you don’t have the time or inclination to wash your hair every day, make use of dry shampoos, which can freshen greasy hair and add thickness to thinning locks. Some even come with built-in color to hide telltale roots! It’s worth keeping a can in your handbag for quick fixes if you suddenly notice your hair has oiled up because of exercise, the weather or stress. In an emergency try baby powder — don’t forget to gently shake/brush it out unless you fancy a white-haired look! Looking at how (and how often) you style your hair can cut down on oiliness too. Combs are better than brushes and the fewer times you can touch or brush your hair, the better. Try to avoid touching your hair, and if it gets really greasy but you don’t have time to wash it, explore off-the-face styles and up-dos like top knots, twists, French plaits, buns and pony tails, which will disguise lank locks. What Else Helps Menopause Greasy Hair? Working from the inside out, don’t forget that diet plays an important role in hair-care. Eating healthily and avoiding greasy food will have a positive effect on your hair and skin and your general health! If you are experiencing other menopause symptoms, pay your doctor a visit — some women find starting HRT can help with skin and hair issues. And if all of the above fails to bring the bounce back to your crowning glory, speak to your hairdresser about a change of style that might help cut down on the visual impact of the oil and make the most of your hair. Most women don’t talk about their menopause, so some of the personal symptoms might come as a surprise when it’s your turn to navigate this change of life.